My head was stuck in indecision. I straddled the fence as I melted the drops of dark chocolate in the hot metal bowl. Should I ladle the hot chocolate rice porridge into bowls as soon as the rice is done? Or should I wait and let the porridge chill in the fridge until it gels into a sweet rice pudding? Difficult decisions. I grew up enjoying steaming hot champorado for breakfast. My mom would make them when the temperature dipped a little, right around the Holidays and after the New Year, before the start of the long scorching hot spell of summer. She would serve them with buttered pan de sal and fried salted herring. The intensely salty fried fish beautifully complements the richly sweet rice porridge. But I grew up enjoying chilled champorado, too. 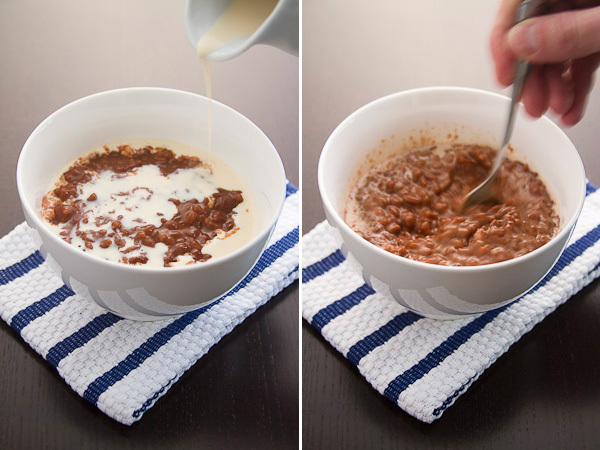 Chilled chocolate rice porridge drowned in evaporated milk was a favorite after-school snack. The milk dilutes the thick porridge and delightfully transforms it into a milky chocolate treat. And so, I found myself terribly indecisive once more when I made champorado last weekend. It was a cold Winter day. The sun was out but it remained chilly. Piping hot champorado would be perfect for breakfast, I thought. But, instead, I practiced a little patience and, in turn, got myself rewarded with my favorite milky chocolate childhood treat. Melt the chocolate in a double boiler or in a metal bowl set on top of a pot of simmering water. Meanwhile, bring rice and water to a boil in a medium saucepan over high heat. Reduce the heat to medium-to-low and let the rice simmer gently. After 15 minutes, add melted chocolate and sugar and whisk vigorously until everything is thoroughly combined. Let the rice simmer for a while longer until it is cooked, another five minutes or so. Serve either hot or chilled with a generous drizzle of milk. 1. In this recipe, I veer away from tradition and use dark chocolate instead of the round blocks of Filipino cocoa called tablea. I suggest using chocolate with 60% cocoa. 2. Cocoa powder can be used instead of chocolate. 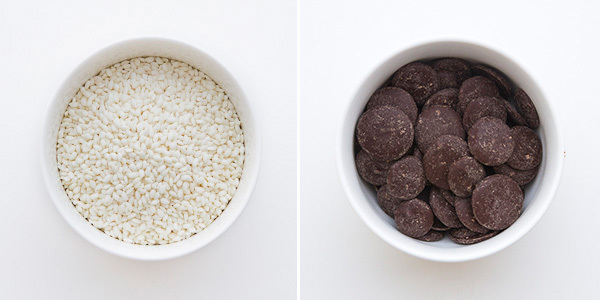 Use 1/2 cup cocoa powder for every cup of sticky rice. For the more traditional champorado made from tablea, use about eight chocolate tablets for every cup of sticky rice. Crush the tablets in a mortar and pestle and whisk the powdered chocolate in the simmering rice as you would the melted chocolate. 3. Whole or low-fat milk can be used instead of evaporated milk. 4. The porridge is fairly thick, just the way I like it, but it can be made thinner by adding a cup or two more of water when cooking the rice. 5. 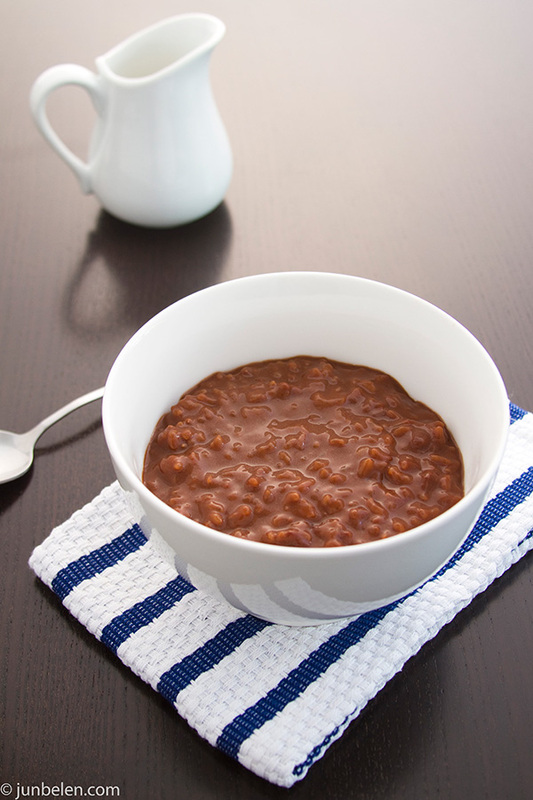 The chocolate rice porridge will keep in the refrigerator for up to a week. The sticky rice will, however, soak up most of the water and thicken when chilled. Add water or milk and reheat on the stove or enjoy them chilled with a generous helping of milk. Jun, you have no idea how timely this post is. My daughter was asking me to make this the other day, and the sticky rice is on my grocery list for the next time I head to the Asian markets! There’s nothing better (and I must say I prefer it hot!). This takes me back to my Lola’s dining room in Manila. I LOVE CHAMPORADO with EVAP and smiley face! My son loves it, too! Thank you, Jun. I think I’ll make some right now for his merienda when he gets home! Definitely with evaporated milk! Carnation or Alaska? Champorado is a definite favorite that brings smiles to my kids faces be it for breakfast or merienda, hot or cold… with evaporated milk or with condensed milk. Awesome pictures as always JUN! It screams “make some champorado now” to me! thanks for posting on this, as i’ve been craving the most random things lately. this is one of them. i’m really wanting to make this over the weekend, maybe even tonight if i have time. oh so lovely! I haven’t had this for many, many years but oddly, I was thinking about it not too long ago. I can almost taste the chocolate and feel the thick, sticky texture of the rice. Thanks for bringing back some good memories, Jun. Your blog posts never fail to impress – gorgeous as always!!!!!! oh, hello there champorado. i have been craving this for weeks now, especially in this very cold weather. Wala pa rin tatalo sa… Alaska! Oh, I really like your idea to eat this cold with an extra drizzle of milk on top. I’ve always liked to eat my rice pudding cold, but adding the extra milk is a great idea! I might try it with almond milk instead of the evaporated milk, I’ve been really liking almond milk for some reason recently. I just made champorado and wow, 1 cup of glutinous rice will feed 6 kids and I have only one. Buti na lang, I eat a lot, LOL. I love this! Thank you so much for sharing! My mom used to make this for me when I was younger, but she always had some mix/prepackaged box of it. Now, I can make this for husband. Salamat! Thank you for following my blog and my tweets, Rina! Champorado is a personal favorite from way back. Glad you can make it now from scratch! That sounds delicious! Coconut milk adds another layer of flavor and I’m sure the black rice adds a lovely color to the porridge. I know, just a cup of sticky rice goes a long long way! Thanks, Annapet! I love this too — thanks for posting — my grandmother (now passed away — sadly) made this for me for breakfast too — I ate tinapa with it and sometimes mackerel that had been marinated in soy sauce, cider vinegar and garlic then fried….can’t wait to try it. I’d seen a version of Champorado in front of a Mexican food market which confirmed suspicions that it came via the Spanish (of course the chocolate clearly came from the Americas, further marking it Spanish). However, my uncle makes a version of champorado called Champorado itim which he makes with pirirutong (black sweet rice) and coconut milk. Funnily enough, I was traveling in Vietnam a few years ago and came across the exact same thing in a Northern Vietnamese cafe. It was called che (which surprised me because I always associated Vietnamese che with another coconut dessert). In any case, this may be another way, similar to arrozcaldo and the like, wherein nativized/Asian derived dishes were renamed in Spanish name. The link between food and culture is so fascinating, isn’t it? The Mexican Champurrado is a thick chocolate drink made with masa and milk, cacao of course, and spiked with cinnamon and vanilla. I wouldn’t be surprised if we, Filipinos, merged the Mexican version with the Southeast Asian rice porridge to make our own version of champorado. Thank you for your thoughtful note. Thank you MaryJo for the thoughtful note. It’s amazing how food triggers memories of home and family. I love the texture of tablea chocolates, too. It has a certain grit that’s delightful. You are doing it the right way — dropping the thick tablets in the simmering rice, letting them melt, and mixing everything well together. Some folks add coconut milk but I like adding evaporated milk. You can always change the consistency by adding more or using less water. Thank you, once again. Cheers to food and memories! How much Tablea do I use to substitute for the 6 ounces dark semisweet chocolate? I would use about eight tablets, which is a little more than six ounces. I would crush the tablets using a mortar and pestle and whisk the powdered chocolate in the simmering rice as you would the melted chocolate. I would still use 1/3 cup sugar. I actually just made some tonight and it tasted so good! Let me know how it goes. I’ve been using Condensed Lowfat Milk…. It tastes nice! I will try this. And I will also follow your blog. Hope you visit mine. maybe you can give me tips on my wedding menu. I wonder if I could use milo powder in this recipe?